What bracha do you make on a fruit cup that has both peaches (ha’eitz) and pineapple (ha’adamah)? What bracha do you make on chicken soup with noodles? Is it just Shehakol? Mezonos? Or perhaps both? Halacha tells us that whenever we eat two (or more) foods together that have different brachos, we must determine which food is the Ikar (main food) and which is the Tofel (secondary food). Sometimes, we are supposed to make a bracha only on the ikar food, but other times, two (or more) brachos are required. The halachos of ikar v’tofel can get pretty confusing, so to clarify these laws, we put together this handy Ikar V’Tofel chart which can guide you through the decision-making process all on one page. NEW CONTEST – For a limited time only! Write 10 examples of Ikar V’Tofel food combinations that YOU personally ate, including which bracha (or brachos) you said on the mixture. Email this page (or your own handwritten or typed list) to TorahDesigns@gmail.com by May 1, 2018 to be entered into a raffle for the chance to win a $10 Amazon gift card! This contest is open to adults, teens, and kids of all ages! This chart was based on a series of shiurim by Rabbi Eliezer Krohn and the chart has been reviewed by Rabbi Krohn for accuracy before publishing. Is this considered an “Ikar V’tofel” combination? FIRST ASK: Is there Mezonos7 in the mixture? If not, continue reading the next line. NEXT ASK: Which food are you mainly interested in eating? Ex. Salad is the ikar, dressing is the tafel, so say Ha’adamah. French fries are the ikar, ketchup is the tafel, so say Ha’adamah. ONLY if you are interested in all parts equally, move on to the next line. Ex. Fruit cocktail (assuming that you are interested in eating all fruits equally) – If 70% of the mixture is Ha’eitz foods (apples, peaches, etc.) and 30% is pineapple then say Ha’eitz. ONLY if there is no clear majority, move on to the next line. Ex. Fruit cocktail (assuming you are equally interested in all fruits, and there is no clear majority) say Ha’adamah because it covers both the pineapple and the Ha’eitz fruits. Ex. Peanut chew (assuming you want both the peanut and the chocolate) say Shehakol because it covers both. …. THE END! You now know which bracha to make. Exception #1: If the Mezonos is there ONLY to hold the food together (not for taste15). Ex. Gefilte fish made with matza meal is Shehakol. Ice cream in a tasteless cone is just Shehakol. Ex. Shnitzel with a very thin16 coating, or fish sticks with a very thin coating are Shehakol. Ex. Beer is made with barley, but since beer is a liquid, it is Shehakol. NOTE A: Mezonos cannot cover liquids. Ex. Noodle soup,20 Mushroom-barley soup. 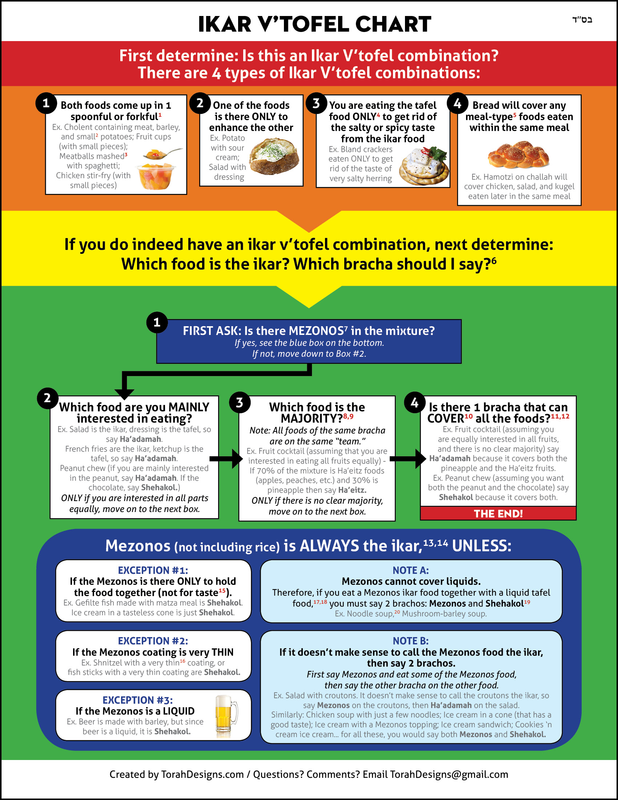 NOTE B: If it doesn’t make sense to call the Mezonos food the ikar, then say 2 brachos. First say Mezonos and eat some of the Mezonos food, then say the other bracha on the other food. Ex. Salad with croutons. It doesn’t make sense to call the croutons the ikar, so say Mezonos on the croutons, then Ha’adamah on the salad. Similarly: Chicken soup with just a few noodles; Ice cream in a cone (that has a good taste); Ice cream with a Mezonos topping; Ice cream sandwich; Cookies ‘n cream ice cream… for all these, you would say both Mezonos and Shehakol. This refers to a natural, subconscious spoonful/forkful – not the type where you are intentionally trying to separate one food from the rest. If the potato pieces are large and you can pick them up by themselves (even if some barley is stuck on) then the potatoes require their own bracha of Ha’adamah, and the rest of the cholent (barley, meat, beans) will be covered with just 1 bracha (Mezonos). Similarly, if the pieces of meat are very large, they require their own bracha (Shehakol). But if there is a plate of spaghetti with meatballs plopped separately on top, this is not an ikar v’tofel combination and would require 2 brachos (Mezonos and Shehakol). In order to rely on this, one must be 100% sure that he is only eating the tafel food for the purpose of getting rid of the taste of the ikar food. Usually this is not the case. For example, if you eat crackers with herring, usually you like the taste of the crackers as well, unless they are completely bland and tasteless. There are some foods that you might eat after bread which are not meal-type foods and are therefore not covered by the Hamotzi. For example, certain fruits or desserts may not be covered by the Hamotzi made on bread. In this context, “Mezonos” refers to foods produced from the 5 grains (wheat, barley, spelt, rye, oats) – not rice. It has to be a substantial majority, like 60%/40%, not like 51%/49%. In a case where 1 food is present more than the other foods – but is still less than 50% of the total mixture, it is a machlokes what to do, so try to avoid this situation. For example, if you have stuffed cabbage containing 40% meat, 30% cabbage, and 30% rice, it is a machlokes whether meat is considered the majority or not. Shehakol covers everything. Ha’adamah covers Ha’eitz (since trees grow from the ground). It is preferable not to rely on this, so ideally one should try to add more to the mixture in order to make a clear majority. In some situations, it is impossible to figure out which bracha is best. For example, sushi (assuming that you are equally interested in the rice, fish, and seaweed, and there is no clear majority) – there is no way to know if it would be better to say Shehakol or Mezonos, because either bracha could cover all 3 parts of the sushi. Similarly, Crispix cereal is half rice and half corn. Mezonos could cover the corn, but Ha’adamah could also cover the rice because some say that rice is Ha’adamah. In the case of Crispix, one can add a handful of cheerios to the bowl to make a clear majority of Mezonos. Mezonos is always the ikar, even if it is the minority, and even if you like the other part of the food better. Even though Mezonos is always the ikar, it is not necessarily the case that one must always say Al HaMichya after eating an ikar-vitofel combination that contains Mezonos. For example, if you eat a slice of cherry pie that is larger than a kezayis but does not contain a full kezayis of Mezonos, then you should say borei nefashos. The following are examples of food combinations which require a Mezonos since the Mezonos is indeed added for taste: Onion rings coated in a flour mixture, potato knish, blintz, ice cream in a cone that has taste. Shnitzel or fish sticks made with a thick coating would be mezonos. If the liquid is absorbed in the Mezonos – for example, a cookie dipped in milk – it’s a machlokes so try to avoid it. First make Mezonos on the cookie, then Shehakol on the milk, then you can dip the cookie into the milk. The halacha is actually unclear in this situation about what to do. Therefore, it is best to do one of the following. Either: (a) Say Shehakol first on the liquid (eg. soup) and then Mezonos on the ikar (eg. noodles); or (b) Say Mezonos on the ikar (eg. noodles) and then Shehakol on a different food like a chocolate chip, to cover the liquid as well. This refers to soup that was made to have noodles as the ikar. However, if you have regular chicken soup and you just drop in a few noodles or croutons, see NOTE B.